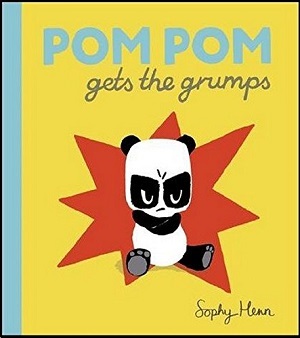 Published February 2015, Pom Pom Gets the Grumps by Sophy Henn is the most recent addition to our ‘behaviour’ books and leaps out from the bookshelves with its vibrant ka-pow cover. Pom Pom’s expression is immediately one of immense anger and disgruntlement all because one morning he got out of bed on the wrong side. 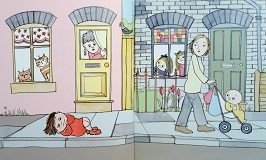 Pom Pom is pictured in the first page with a cloud of grey rain over his head, which doesn’t lift for much of the book. Sophy Henn leads the reader through all the things that go wrong from losing his toy, to a soggy breakfast, to being irritated with his mother, all the way to Little Acorns playgroup/nursery. His nastiness to his friends results in his own-enforced isolation, and immediately his anger turns to regret and he reaches out to them again. I love the fact that Pom Pom realises his own mistake and says sorry, but I also love the twist at the end – children’s moods can swing so suddenly! The story itself is one that has been told before, but the illustrations are magnificent and universally appealing. The simplest lines indicate a brow crease frown, whether in profile or face on, and the friendly animals at the playgroup/nursery are adorable. One to be re-read for certain. 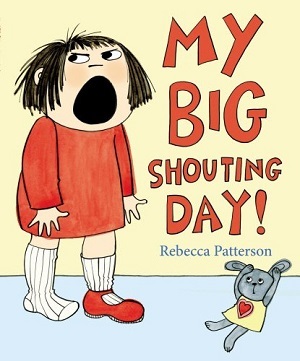 I would recommend My Big Shouty Day by Rebecca Patterson to mothers sitting alone of an evening after a particularly tough day – the first illustration is enough to make the most frustrated parent crack a smile. The book sums up beautifully the weariness of the parents, as well as the embarrassment felt when one’s child creates a fuss at the shops, on a play date, and even in the street. However, it’s also good for the child as the text becomes bigger and shoutier during the book, as the irrationality comes through, and the illustrations get funnier and funnier. “Then it was time for my tea and my bath. Most children will recognise a tiny bit of themselves in it, as they see the simplicity in the overreactions of the child and her unreasonableness. The beautiful ‘sorry’ at bedtime, with the mother’s understanding, “we all have those days sometimes”, leading to a better day in the morning, is the perfect resolution to this Roald Dahl Funny Prize award winner. 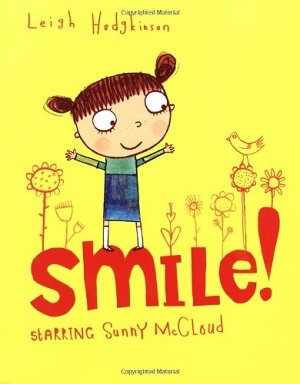 Smile by Leigh Hodgkinson has a quirky design, not unlike Charlie and Lola books, with lots of font changes. Smile is about a small girl who has lost her smile (mainly, it seems, as a result of being told that she cannot have any more biscuits). She spends the day searching for it, asking her family where it might have gone. As she searches, she inadvertently does some good deeds round the house, and then when praised for her good behaviour, the smile returns. It’s a sweet story, and good for bringing a smile to a young reader’s face too. Mum’s and Dad’s solutions for finding lost things also managed to make this adult smile. The illustrations are simple and unconventional, and quite inspirational. This is one I have used with older children too to demonstrate how simple lines can create expression in a face, and that playing with text for emphasis is useful, from underlining to uppercase letters, to simple annotations – such as ‘splishy’ and ‘sploshy’ written in each of the puddles when it rains. A book brimming with imagination. 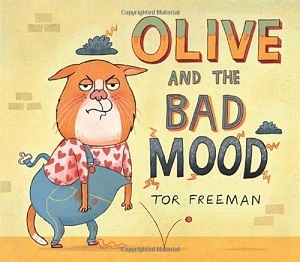 The illustration on the front of Olive and the Bad Mood by Tor Freeman is reminiscent of so many loony tunes cartoons, and raises a smile before we even start. “Olive was in a bad mood. As in My Big Shouty Day, and Pom Pom Gets the Grumps, I liked that there was no reason behind Olive’s bad mood, it was just there. Younger children find it hard to articulate what it is exactly that has made them grumpy or sad. And for older children, it’s okay that sometimes mood changes without a definitive reason. However, in a new twist, Olive’s bad mood rubs off on all the friends she meets, so that when she finally cheers up, she discovers that they are all in bad moods now, and it’s her job to cheer them up. The irony in the end is that she thinks she’s the cause of the cheering up, not the bad moods. This is a good jumping off point for discussion with children about what they do that affects others without them realising, and that it’s important to have self-awareness. What was interesting in both this and Smile, was that food was a big indicator in the mood swings, unfortunately a sad but true fact for many of today’s youngsters. 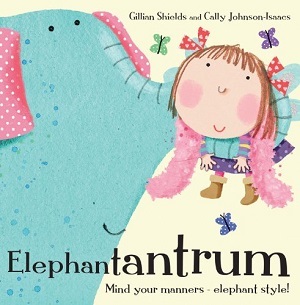 Elephantantrum by Gillian Shields and Cally Johnson-Isaacs is a good example of animals teaching behaviorr in picture books. Ellie is a very spoilt little girl who has everything she wants, and one day she requests an elephant. It’s promptly delivered, but it turns out that this is not quite the elephant she wished for. Ellie’s elephant is extraordinary! It’s the ultimate look in the mirror for Ellie, as the elephant usurps her and wears her clothes, plays with her toys and friends, and finally has an enormous elephantantrum. The tantrum makes Ellie realise that her prior behaviour wasn’t very nice, and as in Olive and the Bad Mood above, it’s not nice for everyone else! It’s a satisfying book with a great message, and a lovely elephant.